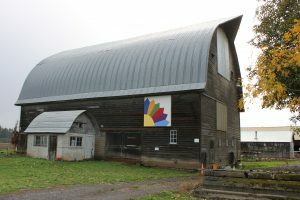 In just three short years, the Quilt Barn Trail of Washington County will include more than 50 blocks on historic barns, granges and other suitable buildings around the county. A project of the Westside Quilters Guild, the Quilt Barn Trail has received acclaim from around the state and was recently featured by Travel Oregon. The trail is designed to highlight the agricultural heritage of Washington County, promote local tourism, create unique public art installations, and pay homage to the craft of quilting. Blocks come in two sizes – 8’x8′ or 4’x4′. Each block is hand painted. Some reflect the history of the property or the family, including a block that was modeled after a family heirloom quilt that survived the Oregon Trail. The Westside Quilters Guild is a nonprofit organization with around 150 members. Sponsors of the trail include Miller Paint, Westside Quilters Guild, Washington County Visitor’s Association, Cultural Coalition of Washington County, Oregon Cultural Trust, GCL Construction, Duyck Machine, and H&S Screen printing.